In 1913, the impact of the “New Art” was felt beyond the confines of the New York’s 69th Regiment Armory. In March 1913, one journalist reported, “disconcerting news comes from Paris. The arbiters of fashion have become inoculated with the futurist germ…Hence they are going to embody those strange artistic ideas into millinery and dressmaking art.” Unenthusiastic about the new designs, the author mockingly commented that “two-fingered gloves” would become “the acme of smartness.” Similarly, the New York World reported on modernist “Styles that Really Startle,” including makeup and hair dye in shocking colors. Cartoonists frequently caricatured fashionable women with cubist-inspired distortions of form. 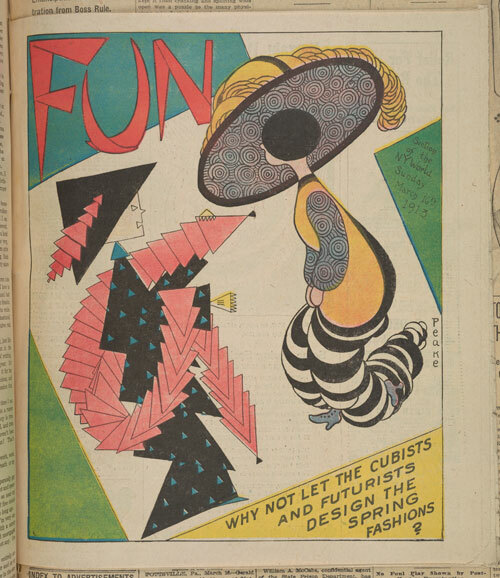 But, jokes aside, what did so-called “futurist” or “cubist” fashions actually look like?